I'm using the freeware version, and it fulfills my needs. @bigspud: "SSD not detected, i have three vertexs in raid0" - it's a decent RAID, so I'm sure you know that RAID doesn't support S.M.A.R.T. Giving this app a 1 because it's not for your needs! What a joke! $14/year for this scam! 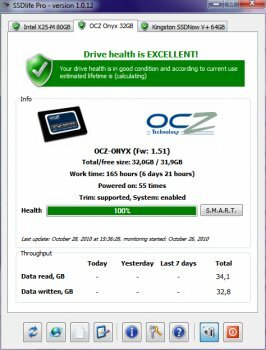 I was hoping for more, but think the author has a good approach - simplified display of SSD SMART (and other) statistics. However, I got no important information about my drive, and any other SMART utility would give me the same raw output (and then some). Oh well... I hope this program improves in the future. Best wishes to the author. Does the job simply put.